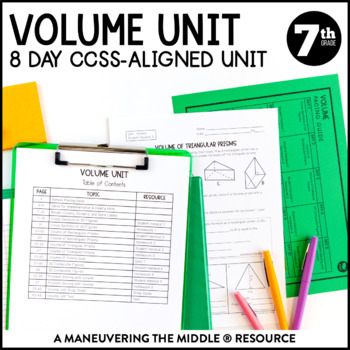 An 8 day CCSS-Aligned Volume Unit - including finding the volume of rectangular prisms, triangular prisms, and composite figures, as well as cross sections of 3D figures..
Texas Teacher?Grab the TEKS-Aligned Volume Unit.Please don’t purchase both as there is overlapping content. 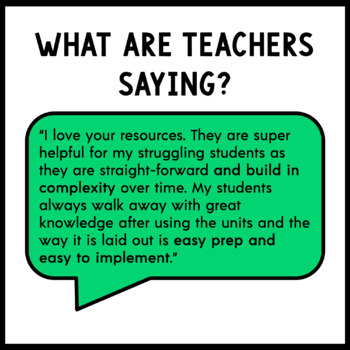 Streamline planning with unit overviews that include essential questions, big ideas, vertical alignment, vocabulary, and common misconceptions. A pacing guide and tips for teaching each topic are included to help you be more efficient in your planning. Student-friendly guided notes and aligned quick homework that are scaffolded to support student learning. A quiz, unit study guide, and editable test allow you to easily assess and meet the needs of your students. 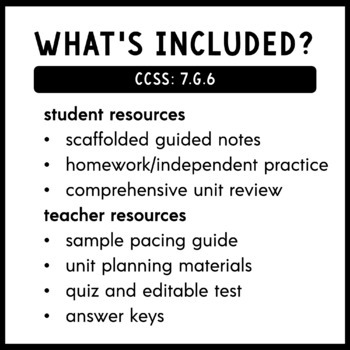 Please note that classroom activities are NOT included but can be found in my Volume Activity Bundle. Interested in other CCSS-Aligned Volume Activities? Check out my Volume Activity Bundle, Volume Unit Bundle, or 7th Grade Math CCSS-Aligned Curriculum Bundle. This file is a license for one teacher and their students. Additional licenses are discounted. Please purchase the appropriate number of licenses if you plan to use this resource with your team. Thank you! Maneuvering the Middle on the Web for teacher tips, tricks, and math fun! Products by Maneuvering the Middle, LLC may be used by the purchaser for their classroom use only. This is a single classroom license only. All rights reserved. Resources may only be posted online if they are behind a password protected site. Campus and district licensing is available please contact me for pricing.